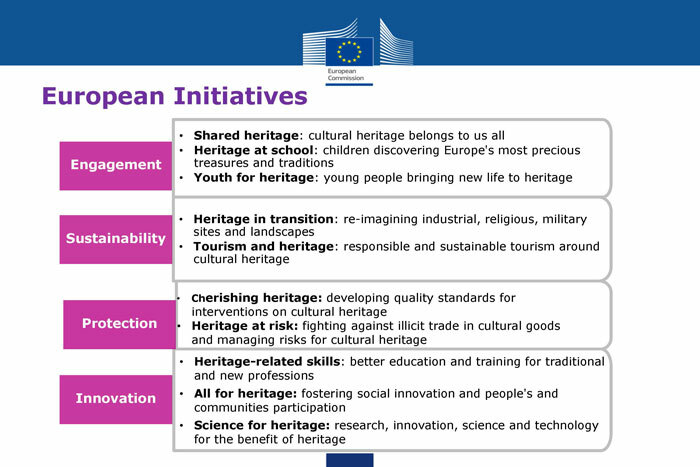 The spearheads of the European Cultural Heritage Year | . Throughout Europe, citizens, associations, governments, institutions - are incited to launch and organize activities to highlight heritage. These can be broad information campaigns, but also small-scale events in a municipality, educational projects, campaigns to raise awareness of citizens and governments about the value and potential of heritage. In addition, special activities will be organized at European level, in cooperation between the European Commission, the EU Parliament, the European Council, the Committee of the Regions and the European Economic and Social Committee. From the European Commission, ten spearheads, divided into four chapters, are forwarded. These are also elements discussed during the E-FAITH workshop in Barcelona in January. Engaging young people and introducing the industrial heritage in eductaion was the theme of the 2017 annual E-FAITH weekend, "Industrial Heritage - exploring opportunities for education and lifelong learning." During this meeting, VVIA presented a report on the experiences with the EUmillennialsTOUR project, and this report will be fine-tuned in the next couple of months. In 2018, the theme of the weekend will be "Industrialization, Science and Technology, Key to European Integration"
These themes are an excellent starting point for the industrial heritage. E-FAITH always has been promoting and encouraging re-use of industrial buildings, to guarantee its survival. The October theme month in 2018 is devoted to this topic. As far as industrial heritage tourism is concerned, E-FAITH gained valuable experience both in the EUmillennialsTOUR project and in the Genius Loci / Industriana project. The latter was officially closed in Brussels at the end of September,; and laid the basis for labeling with QR code of industrial sites and collections. fight for the safeguarding of endangered heritage, defend sites that are in one or another way threatened, take measures against the stealing and illegal trade of heritage objects, develop a general risk management for the heritage. For modern art (sic), fortunes are paid, and the most sophisticated and expensive conservation and restoration techniques are applied. In many cases the industrial heritage is still considered to have only a scrap-value . Bits and pieces of ‘rescued ' machinery disappear without one noticing it. It is 'restored' (sic) by non-professionals, reconstructed to working conditions - without taking into consideration the generally accepted basic principles and ethics of restoration-conservation. When an old textile mill or a flour mill is turned into lofts, or a shopping or cultural centre, the equipment which tells the story and the function of the building is removed and scrapped. In all countries, associations and volunteers do their utmost best to save the industrial heritage, a avant-garde that is not always respected, often considered to be strange and foolish. They need support - and international solidarity can be of great help for them. Unfortunately - and we do fear - this item seems to be limited to illicit trade and 'managing risks', not including campaigns to save endangered sites. The industrial heritage also witnesses a globalization-avant-la-lèttre. This means that industrial products, equipment, even buildings and bridges are not necessary kept in the places where they have been invented, created, built. Since the start of the Industrial Revolution they have been exported between European countries. They now remain in places where they are not valuated as such by local authorities, while the authorities of the countries that created them have no power to protect or save them abroad. How can the French protect for example a French steam engine which is endangered in Spain, Portugal or Belgium ? For the maintenance and restoration of industrial and technical heritage, many new techniques as well as traditional technologies and know how can be applied. However, apparently little research is done in these fields - and the training for specialized conservators-restorers is extremely sown in Europe. In many cases, one only can learn the job 'hands on'. We have to advocate more and better scientific research, as well as thorough quality guidelines and standards for conservation-restoration of industrial and technological heritage. One has to provide more and better museum and heritage storages for industrial heritage objects, preventing them from rusting away in a non-appropriate environment. One also has to provide more and better conditions to involve the general public with the industrial history and heritage. Today the lives of old kings and prelates are often better known - and taught in schools - than the lives of great inventors, industrialists and of the men and women who by their labour created today's society. New technologies can help to understand this history and obsolete technologies, can show and explain how technology changed our world.We need to elaborate good and new techniques to interpret and explain the industrial heritage to an audience that has little or no background to the history of industry and technology, and / or technology as such. How do we bring that story? How do we present the industrial heritage? How do we write a good scenario for the interpretation and presentation of the industrial heritage, for a museum, for a building, for a region? 2018 will undoubtedly be an exciting, vibrant, busy, hectic heritage year. A year in which the industrial and technical heritage will have to be on its best, present and defend its values. To clarify its position and specificities within the heritage world. We will (have to and shall) fall back on our experience, the knowledge and experiences of our volunteers, and the networks and contacts we have been able to build over the years. E-FAITH is ready for the European Year of Cultural Heritage and will therefore take the lead in Europe.